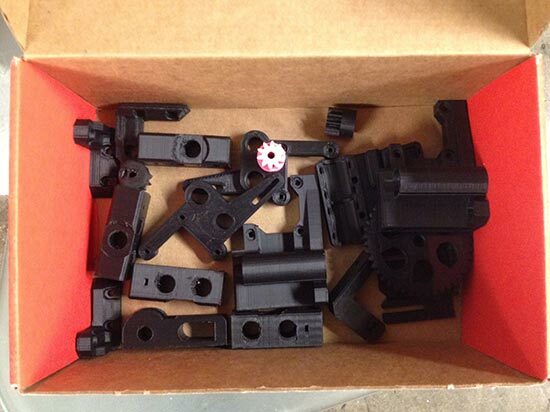 I’ve got a box full of Prusa i3 Rework parts! Well, not the full box, but we’re working on it. When I say “we” I mean myself and my team. This is all for a class titled “Digital Fabrication and Craft: Machines that Make”, which Frankie mentioned recently. We’ve talked a lot about machines that make, and a little bit about MIT and what they’ve done. If you’ve seen the Othermill, you may or may not know it originated from an MIT project called MTM Snap. And there’s more! For the second assignment each student needs to design and build a machine that can make things, and then we need to make things. Yes, we are rapid-prototyping rapid-prototyping machines. It’s a class made for makers, for sure. Our obstacle was that Jonathan had never intended MTM Snap for production. It was a design challenge experiment: to see if he could build a machine without screws. This is a great feature if you’re trying to save money as a graduate student, but from a manufacturing standpoint it had two major disadvantages. Go read the whole thing if you’re interested in this. Since I’ve also been designing kits that are meant to be assembled and disassembled multiple times, I’ve seen similar (but different) challenges arise. But honestly, this all fits under the heading of “design” to me, because I still think design is about solving problems. I’ve also been thinking a lot about the machine I’ll build. I probably won’t build a drawing machine right now (more on that later) but there’s a reason I’ve been researching the Othermill and been hankering to use a Shapeoko. It’s all coming together! Posted on Friday, February 6th, 2015 at 1:41 pm. Subscribe to the comments feed. Both comments and pings are currently closed. Post on your own blog.